My name is Darlene Clark, and I live in Savannah, Georgia. I am married to a wonderful man who I am honored to call my husband of more than 25 years. We have a passion for helping others, and volunteer with local organizations and with our church whenever we can. We enjoy working with our hands, and keep very busy. We love to travel, and have had the pleasure of visiting some beautiful places. The love of crafting and woodworking was instilled in me by my parents from a young age. However, my journey with the stamping industry began in a little store in downtown Savannah called, Sign of the Clef that was owned by Martha Ellen Stephens. I signed up for a class with a wonderful, exuberant teacher by the name of Pamela Martin. 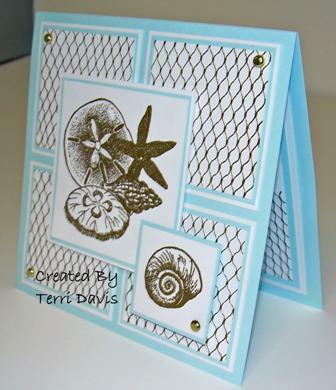 Pam’s class had me enjoying multiple techniques and projects with stamps and inks- I was hooked. As I have had the opportunity, I have sought out other stores when on vacations or business trips, and looked for conventions nearby. I have taken classes from other teachers, the wonderful and talented Holly Craft, and Lovely Linda, among others. After an Heirloom Convention several years ago, I was in a store that was located in Greenville, SC, called Stamps & More by Eleanor. I met an interesting couple by the name of Buck & Christine Davis. They were visiting the convention and their friend, Eleanor. I enjoyed a friendly chat with them about their travels and “the business”, not realizing that our paths would cross again. In the summer of 2009, while visiting my friend, Jane, at her beach house at Holden Beach, North Carolina, she insisted that we go to a nearby store in Surfside Beach, SC, called- you got it- Artful Legacy. We received notice soon after that visit that the retail store would be closing, and Buck & Christine would only do online sales and shows. However, like Buck said, “Never say never.” So, in September 2010, Buck & Christine, moved to the town of Lugoff, South Carolina, and decided to open Artful Legacy in the precious nearby city of Camden, South Carolina. Buck had his small, but efficient workshop situated out behind the store and bragged about his “same day service” for out-of-stock stamps. But although it was beautiful, it was too far away from their beloved coast, so on March 1, 2012, they decided to close. This time, it was for good, and an email reached me late that afternoon that the store inventory and its equipment were for sale. My call to Buck the next day was short and to the point.